It may seem like a long shot, but the highly anticipated presidential contest between Hillary Clinton and Donald Trump could go to overtime after Tuesday, November 8 if the candidates each have 269 votes in the Electoral College. We wrote about this topic last month and offered at least four scenarios where the Electoral College vote could be a tie, which would trigger the 12th Amendment of the Constitution into action. And as of Friday morning, at least one scenario is still out there, based on polling data that show New Hampshire as a possible addition to the Republicans’ column. The popular election-tracking site Real Clear Politics compiles polling data into averages by state and projects possible Electoral College outcomes. 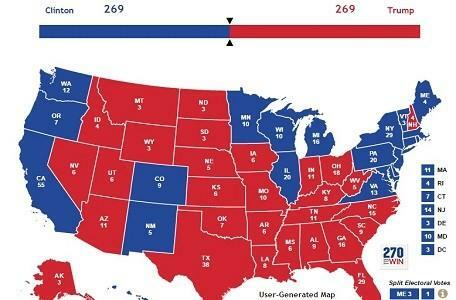 As of early Friday morning, the Real Clear Politics No Toss-Up Map showed the projected outcome as 298 votes for Clinton and 240 votes for Trump. That scenario assumes Florida and its 29 electoral votes go to Clinton. If not, and Trump takes Florida, the count is 269-269. Note: If you would like to figure out your own Electoral College scenarios, the website 270towin.com is an excellent resource. The Real Clear Politics No Toss-Up Map shows which candidate leads within a state by summing up the average of recent polls. On that map, key swing states New Hampshire, North Carolina, and Nevada are in the Republican column, along with Ohio and Iowa. The Democrats would keep Pennsylvania, Virginia, all of Maine, three big Midwestern states (Michigan, Minnesota, and Wisconsin) and Colorado. The election would then pivot on Florida and the possibility that Maine’s second congressional district could send its one electoral vote, under that state’s election system, to Trump instead of Clinton. In that case, with Florida and Maine’s CD2 vote in the Republican column, the GOP takes the election in a 270-268 vote. To be sure, there are many possible outcomes on Tuesday and polling data have been problematic in many prior elections, but it is also important to understand there are constitutional provisions for deciding the winner of the presidential and vice presidential contests if no clear majority winner emerges after Election Day. In a tie scenario, the election would eventually head to the House of Representatives and the Senate, under the 12th Amendment, assuming that the final Electoral College vote is similar on December 19, 2016. This has happened twice before. After the 1824 election, when no presidential candidate won a majority of the electoral votes, the House picked John Quincy Adams over Andrew Jackson (who had the most popular votes) as President. And after the 1836 election, there was a contingent election in the Senate for Vice President won by Richard Mentor Johnson. Before the contingent elections get to the House and Senate for a vote, however, several things need to happen. First, at a state level, the election results need to be confirmed; in particular, the winning slate of electors for a state is confirmed. This is where the disputes in 1876 and 2000 over electors had to be resolved. There are also the possibilities of recounts and contested elections within states where a recount is automatically triggered (like the 2000 contest in Florida) or of a legal action leading state courts to decide lawsuits related to contested elections. Under a federal law known as the safe-harbor provision, a state must determine its electors six days before the Electoral College members meet in person. In 2016, that safe-harbor deadline is December 13, since the college votes on December 19. The electors for each state convene on December 19, 2016 at their state capitols and in the District of Columbia. In 48 of 50 states, just the electors who represent the candidate with the most popular votes on Election Day each get to cast votes in the Electoral College election. (Maine and Nebraska split votes by congressional district.) Each state group sends its endorsed, official vote count certificate to the Vice President (acting as President of the Senate), state officials, the federal court that had jurisdiction over the state capital area, and the federal Archivist. The vote certificates must be received in Washington by December 28. In 2017, the new federal Congress convenes on January 6 for the official Electoral College vote count. The Vice President will open the vote certificates and pass them to four members of Congress, who count the votes. If there is a majority winner with at least 270 electoral votes and there are no objections filed by members of Congress, the Presidential election is certified and over. If there isn’t a majority winner, the House decides who is President; the Senate decides who is Vice President. In the House, each state delegation gets one vote in the presidential contingent election. Currently, the Republicans have the clear majority in 33 state delegations out of 50 in the House, before Election Day. Each member of the Senate gets one vote in a contingent election. That could allow for the unlikely pairing of a President and Vice President from different political parties – which hasn’t happened since 1796. And there are also some unlikely but possible scenarios. For example, there could be a vote cast by a faithless elector at the state level during the December 19 electoral college vote, which may lead someone in the House or Senate to contest that vote. Who are the Electors in the Electoral College?